Not bad for a cheap Chinese lamp. Just go easy on the wick-riser and do not force it. For a guy who uses one of these only occasionally, this will do quite well. Overall the alcohol lamp is of good quality but there is something amiss with the wick. I'm using denatured alcohol in the lamp and cannot keep it lit, it will burn for a few minutes then slowly burn out. The lamp is as full as I can get it and the wick is fully submerged but the problem persists. Perhaps I need to try a different fuel although it is an alcohol lamp. The wick does not work well unless the reservoir is filled to the top. As a result the flame is small. If I raise the wick up higher, the wick material begins to disintegrate. So in order to work efficiently the reservoir has to be kept full at all times. A better wick material would work better I think. I'm quite pleased with this alcohol lamp. My problem was that I needed an inexpensive, portable heat source for an encaustic drawing technique that I'm developing. I originally bought a couple of cans of Sterno, but was disappointed with how long they lasted, as well as the expense. 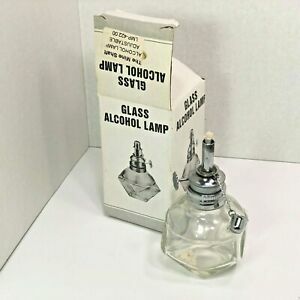 I then remembered the alcohol lamp that I had in my youth that came with my Gilbert chemistry set. This lamp is definitely better: the wick is adjustable, and the snuffer cap is attached (my only issue is the weakness of the chain). The flame is actually hotter than the Sterno, which speeds up my process. I also like the looks of this lamp. The price was reasonable, and the delivery was sooner than expected. All in all, a very satisfactory transaction. I have never used an alcohol before, but this one was easy to use with pin point accuracy.